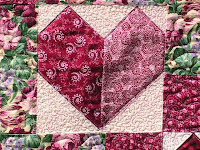 Since many people discovered this blog because of my playing around with the Disappearing 9-patch and putting pieced blocks in the corners, I have to share Pat K’s quilt, Hearts and Roses. 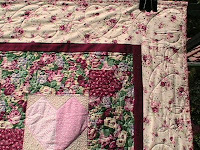 It was her first attempt at a disappearing 9 patch using the scrappy hearts blocks she won in Block Lotto a little over a year ago. She said that she really enjoyed putting this together because of all the hearts from everyone. 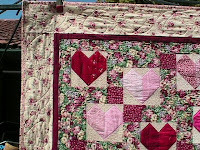 I just love how it turns out and the quilting designs she chose really compliment the piecing. She meandered around the blocks and stippled around the hearts. 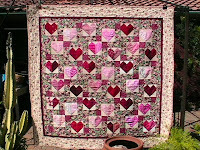 Her friend Diana quilted the border with a digital heart pattern.